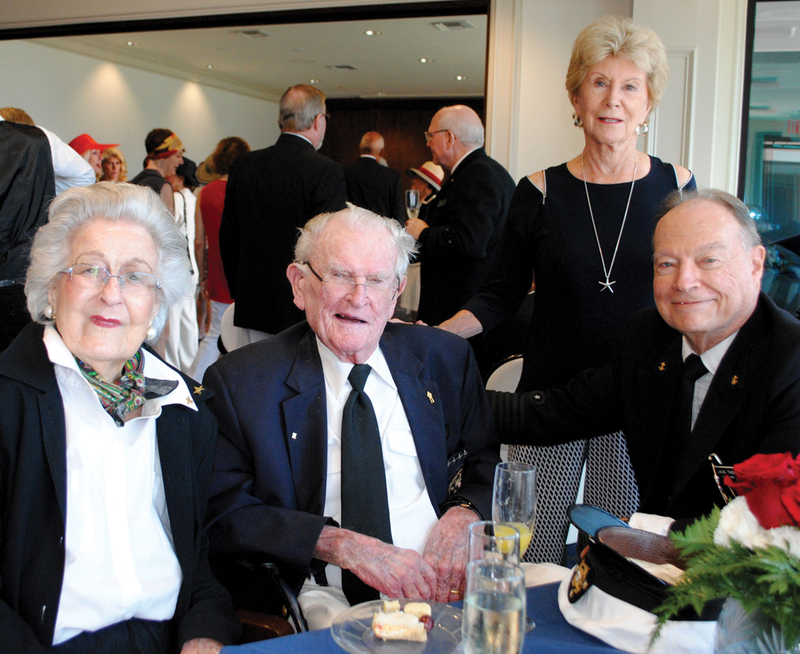 Richard Allen, left, Lakewood Yacht Club commodore in both 1970 and 1971 and now 92, gets a warm welcome at the Blessing of the Fleet champagne reception for past commodores from PC Jack Thomas and his wife, Alice, at right, and Dr. Anna Dewald, widow of 1975 PC Lester Dewald. 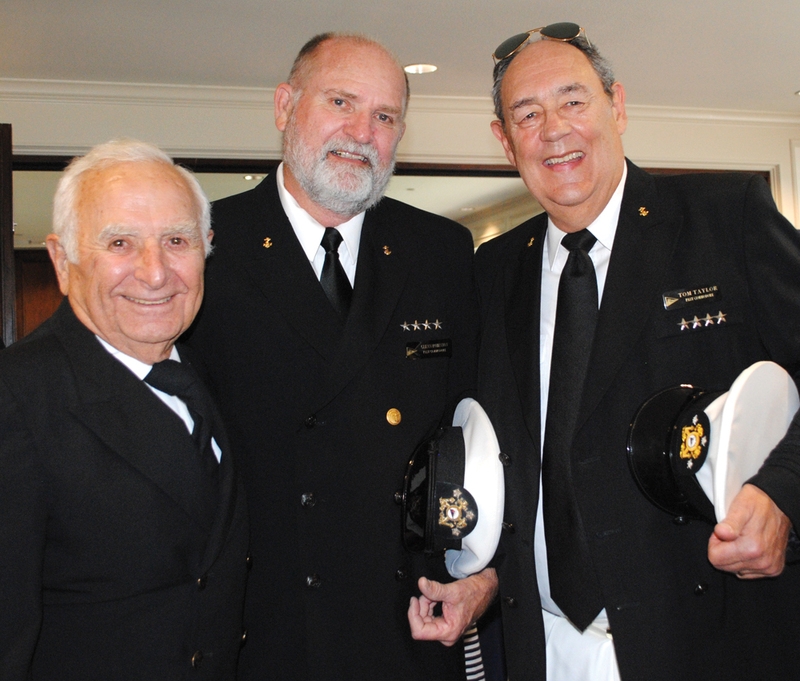 Past Commodores Don Genitempo, Glenn Robinson and Tom Taylor, from left, were among the many attending the champagne reception preceding the 2017 Lakewood Yacht Club Blessing of the Fleet ceremonies. Lakewood Yacht Club members, with their oldest surviving Past Commodore – Richard Allen — looking on, gathered by the harbor March 19 as boats were christened and the club began its 62nd Opening Day Ceremonies. Commodore Jim Winton and his wife, Cindy, got the day off to a happy start, hosting past commodores and their wives at a champagne reception in the Harbor Room, where they and Vice Commodore Ashley Walker, Rear Commodore Tom Frankum, Fleet Capt. 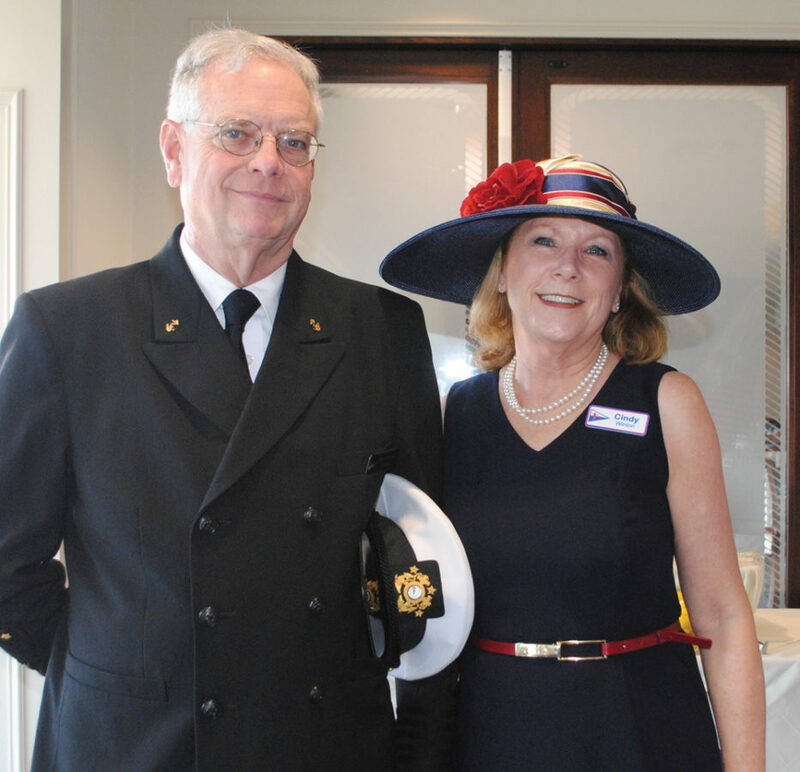 Rex Bettis and their wives and Ladies Association President Amy Dunphey also welcomed Houston Yacht Club Commodore Steve Gillett and several of his line officers. Allen, now 92, was all smiles as several past commodores stopped to say hello to him and his daughter, Amanda Dwyer. The retired attorney served two terms at Lakewood’s helm nearly 50 years ago, in 1970 and 1971 – one of only four who have served two terms as commodore. Afterwards, they turned their attention to the harbor, where the happy sounds of Cy Fair High Marching Band and the Houston Highlands Pipes & Drums signaled the start of another LYC boating season. LYC Commodore Jim Winton and his wife, Cindy, prepare to welcome a number of past commodores and their wives to a champagne reception in the Harbor Room before the ceremony.